The standard (best estimate) curve of atmospheric CO2 for the past 150 million years from GEOCARB III (Berner and Kothavala, 2001) is compared in figure 5.2 with the results of two other recently published carbon cycle modeling studies (Tajika, 1998; Wallmann, 2001). (In the carbon cycle study of Kump and Arthur , a CO2 curve was calculated but believed by them to be incorrect, and in that of Francois and Godderis , no CO2 curve was presented.) 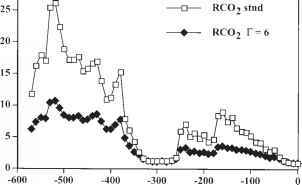 In the overall trend of decreasing CO2 with time, there is general agreement between the results of the three studies, but disagreements arise as to absolute RCO2 values and shorter term variations. The Mesozoic values for GEOCARB III are higher than the results of the other two studies mainly because values of fE(t) for Mesozoic gymnosperms versus angiosperms were used in GEOCARB that best fitted the independent RCO2 data of Ekart et al. (1999). 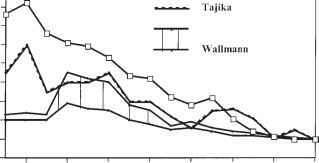 The non-fitted results of the earlier study, GEOCARB II (Berner, 1994), better agree with those of Tajika (1998) and Wallmann (2001). Together the results of the three studies are in accord with the conclusion that overall global cooling over the past 150 million years can be explained, at least partly, by a diminished atmospheric greenhouse effect due to a decline in atmospheric CO2. Figure 5.2. 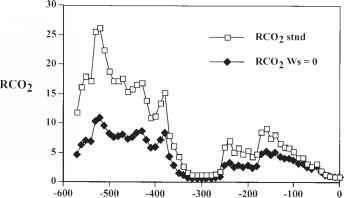 Plots of RCO2 versus time for the theoretical modeling results of Tajika (1998), Wallmann (2001), and Berner and Kothavala (2001). 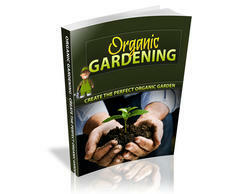 land plants (see chapter 2). The plants both accelerated weathering and provided biologically resistant organic remains for burial in sediments, causing a drop in CO2. This major effect of plants is also shown by the modeling results of Bergman et al. (2003) and Mackenzie et al. (2003). The results of Bergman et al. are compared to those of GEOCARB III in figure 5.3. Both curves show a large drop in CO2 during the Paleozoic, but the Bergman curve shows less variation in CO2 from 350 to 100 Ma, with no high values during the Mesozoic as calculated by the GEOCARB model. Carbon cycle models can give some idea of how the composition of the atmosphere and oceans may have varied over geologic time, but their chief utility is in determining sensitivity to changes in values of inputted parameters. One way of showing sensitivity is to hold constant, at the present value of 1, each dimensionless f parameter that normally varies over time. Another approach is to vary critical constants in the climate and biological feedback expressions. This procedure is illustrated in figures 5.4-5.12 using results from GEOCARB III (Berner and Kothavala, 2001). Figure 5.3. 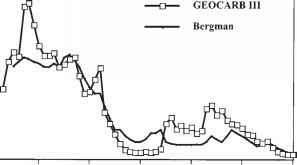 Plot of RCO2 versus time for the standard or best estimate GEOCARB III model of Berner and Kothavala (2001) compared to the results from the model of Bergman et al. (2003). to one-eighth. The best estimate used for the standard situation, shown in figure 5.4, is one-fourth. The high sensitivity to values of fE(t), and how they change with time, shows how important it is to obtain more data on the role of plants in weathering. Changing paleogeographic parameters also has a major influence on the evolution of atmospheric CO2. The effect of holding fR(t), the relief or mountain uplift factor, equal to 1 is shown in figure 5.5. The result is a dramatic drop in CO2 during the Mesozoic and Cenozoic (past 250 million years). The effect of holding the parameters fD(T) and fA(t), which manifest the effect of paleogeography on river runoff and discharge, equal to 1, is shown in figure 5.6. This results in a much smaller effect than holding fR(t) equal to 1. The effect of letting GEOG = 0 in the expression for fBt(CO2), which is equivalent to saying that continental drift had no effect on land temperature, is shown in figure 5.7. This shows a large effect during the early Paleozoic and a large relative effect in the early Mesozoic (250-180 Ma). These results illustrate that, based on the available paleogeographic data used in the GEOCARB modeling, mountain building and changes in land temperature accompanying continental drift over Phanerozoic time had a greater effect on CO2 than changes in land area and global runoff. Figure 5.4. Comparison sensitivity plot of RCO2 versus time for the situation of fE(t) = 1 for all time compared to the standard GEOCARB III curve (stnd). This shows the effect on CO2 of ignoring plant evolution and holding for all time the influence of plants on weathering to be the same as at present. Figure 5.5. Comparison sensitivity plot of RCO2 versus time for the situation of fR(t) = 1 for all time compared to the standard GEOCARB III curve. This shows the effect on CO2 and on weathering of holding the relief of the land, as it affects erosion, to be the same as at present. Figure 5.6. Comparison sensitivity plot of RCO2 versus time for the situation of fA(t) = 1 and fD(t) = 1 so that fAD(t) = 1 for all time compared to the standard GEOCARB III curve. This shows the effect on CO2 and on weathering of holding both land area and river runoff to be the same as at present. Figure 5.7. 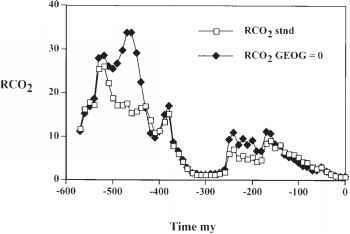 Comparison sensitivity plot of RCO2 versus time for the situation of GEOG = 0 for all time compared to the standard GEOCARB III curve. This shows the effect on CO2 and on weathering of holding land temperature to be the same as at present. Figure 5.8. 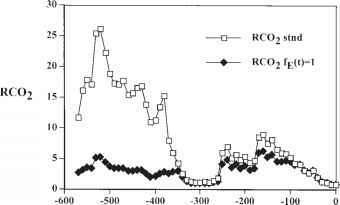 Comparison sensitivity plot of RCO2 versus time for the situation of r = 6 for all time compared to the standard GEOCARB III curve. 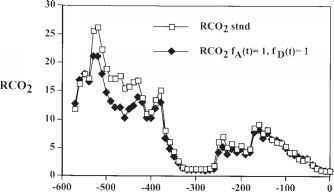 This shows the effect on CO2 and on weathering of changing the coefficient, r, that relates temperature to CO2 via the atmospheric greenhouse effect. The value of r = 6, higher than those values used in GEOCARB III modeling, illustrates the situation of greater sensitivity of temperature to CO2 level and stronger negative feedback. is equivalent to changing the temperature rise, due to a doubling of CO2, from 2.3-2.8 to 4.1°C. This difference falls within the range of values predicted by GCM models for future global warming (IPCC, 2001). The effect of changing r is large for all times because it is a key component in the calculation of RCO2. A more sensitive climate to CO2 change means a lesser variation of CO2 levels over time. In other words, for a larger value of r, there is stronger feedback and greater damping of oscillations. Varying Z, which expresses the effect of temperature on mineral dissolution rate (equation 2.11), is shown in figure 5.9. Again, there are major changes in CO2 for all times, and Z is another important feedback damping factor. Finally, the effect of varying the exponent n in the biological weathering feedback factor fBb (CO2) (equation 2.6) is shown in figure 5.10. Values of n = 0 and n = 1 represent the situations where no plants and all plants, respectively, increase weathering in response to increases in atmospheric CO2. Changes in the value of n have a major effect on CO2 in the Mesozoic and Cenozoic, but no effect during much of the Paleozoic when large plants were not present. Figure 5.9. Comparison sensitivity plot of RCO2 versus time compared to the GEOCARB III standard curve for the situation of varying Z, the coefficient that relates the rate of mineral dissolution during weathering to changes in temperature. This shows the effect on CO2 and on weathering of varying the activation energy for dissolution (see table 2.2). Figure 5.10. 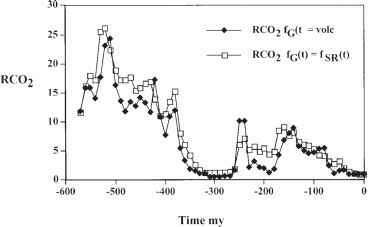 Comparison sensitivity plot of RCO2 versus time compared to the standard GEOCARB III curve for the situation of varying n, the exponent that relates the rate of plant-assisted weathering to CO2 fertilization of plant growth. If n = 0, no plants globally respond to CO2 fertilization; if n = 1, all plants respond to CO2 fertilization. The standard curve is for n = 0.4, indicating that about 35% of plants globally respond to CO2 fertilization. Kasting, 1992). 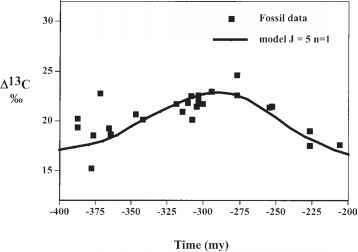 The effect of an increase in solar radiation of about 6% over the Phanerozoic can be seen in figure 5.11. When the value of Ws in equation 2.29 is set equal to zero, signifying no change in solar radiation over time, the overall negative slope of the CO2 curve flattens considerably. 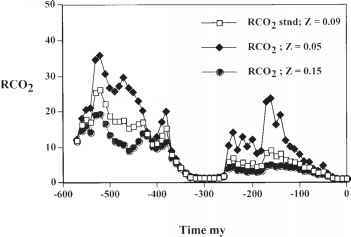 This means that the effect on CO2 of a steady increase in solar radiation over the Phanerozoic is matched by an overall decrease in CO2. Extrapolation of this inverse effect to the distant future indicates that the solar-driven drop in CO2 would attain such low values in about 900 million years that photosynthesis would cease (Caldeira and Kasting, 1992). Figure 5.11. 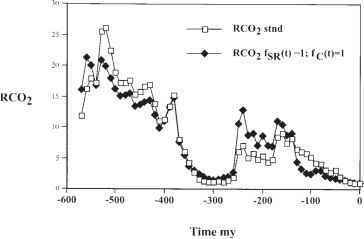 Comparison sensitivity plot of RCO2 versus time compared to the GEOCARB III standard curve for the situation of holding Ws = 0. Ws is the coefficient that relates the rate of weathering to changes in temperature due to changes in solar radiation. Ws = 0 means no solar evolution over time, with irradiation held constant at present levels. Figure 5.12. Comparison sensitivity plot of RCO2 versus time for the situation of fSR(t) =1 and fC(t) = 1 for all time compared to the GEOCARB III standard curve. 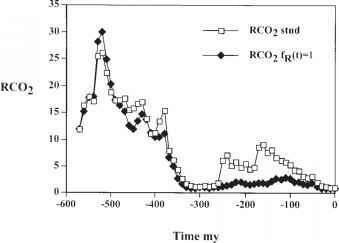 This shows the effect on CO2 of holding global CO2 degassing to be the same as at present. Figure 5.13. Comparison sensitivity plot of RCO2 versus time for the situation of fG(t) = fV(t) for all time compared to the GEOCARB III standard curve based on fG(t) = fSR(t). The variable fG(t) is the rate of global CO2 degassing at a past time (t) divided by that for the present. The variable fV(t) is the value for fG(t) calculated from the abundance of volcanic rocks over time (Ronov, 1993). The variable fSR(t) is the value of fG(t) calculated from changes in seafloor spreading rate over time. 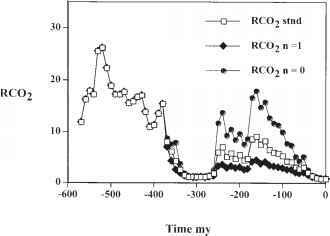 all three formulations, no change in degassing, use of spreading rate, and use of volcanic abundance, result in curves of RCO2 that are crudely similar. This means that the effects of parameters other than degassing, as discussed above, are more critical to the overall Phanerozoic history of atmospheric CO2. Either further improvements in degassing formulation are necessary, or degassing has had a lesser effect on Phanerozoic CO2 evolution than is commonly believed by most workers (e.g., Berner et al., 1983; Tajika, 1998; Wallmann, 2001; Schrag, 2002). Considering our present state of knowledge concerning degassing (see chapter 4), it is probable that the truth lies somewhere between these two extremes. At any rate, I suspect that the GEOCARB spreading rate degassing formulation probably needs to be changed. For the sake of completeness, I present an example for the results of models of short-term perturbations to the long-term carbon cycle. A characteristic of all these models are asymmetric curves of CO2 and other output variables versus time. A sudden change is followed by a gradual return to steady state as the inputted carbon perturbation is diluted and carried through the long-term cycle (Caldeira and Rampino, 1990; Kump, 1991; Dickens et al., 1997; Dessert, 2001; Beerling and Berner, 2002; Beerling et al., 2002; Berner, 2002). The example chosen here is that presented by Berner (2002) to explain a large negative excursion of 813C of sedimentary carbonates across the Permian-Triassic boundary. Two explanations that have been offered for the isotope excursion are CO2 degassing associated with volcanic eruption from Siberian basalts at that time and release of CH4 from methane hydrates, which are oxidized rapidly to CO2 in the oceans or atmosphere. In the model, carbon dioxide with 813C = -6% is released from the mantle over 200,000 years (from 2.5 x 106 km3 of basalt), or methane with S13C = -65% is released from methane hydrates over 20,000 years and rapidly oxidized to CO2. Both releases follow a Gaussian distribution with a maximum release rate halfway through the release period (see figure 5.14). The results for S13C, based on reasonable estimates of the time-integrated release of 11000 GtC of volcanic CO2 or 4200 GtC of CH4, are shown in figure 5.15. The drop of about 7% in S13C from CH4 degassing matches observations (e.g., Twitchett et al., 2001), but such a large drop could not be attained by appealing to volcanic degassing (volcanic CO2 in figure 5.15). This is because volcanic carbon, derived from the mantle, is not sufficiently isotopically light. A drop of 7% would require impossibly high fluxes of volcanic CO2.